The first truly automated solution for measuring, notching and cutting of AC (BX), MC Cable & FMC ranging from 1/2"–1" OD aluminum & steel. Once the operator enters the parameters for whip requirements during initial setup, the machine does the rest. The entire operation is fully automated and increases productivity. The operation automatically repeats for the entire length of the cable, freeing the operator to complete other tasks and allows for running equipment lights out. 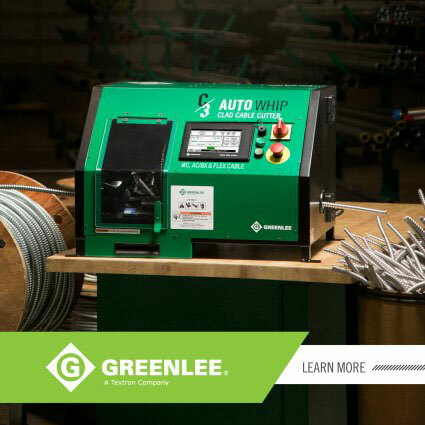 The C3 Auto Whip™ Clad Cable Cutter features a touch screen interface, which allows the operator to input the correct cable configuration so that the machine is aware of the cable size, type, and desired whip length. Also featured is a USB input that will allow custom whip configurations to be uploaded into the machine. Additional features include an emergency stop button that will halt machine operation if necessary, as well as, a lockout/tag out feature to ensure the machine is de-energized during blade changes. The Polycarbonate shield allows for operator to safely view the cutting operation and provides access for blade replacement. The carbide tipped blades provide clean cuts with no jagged edges. Protect your most valuable tools with confidence and personalize select bags for uniqueness with embroidered name plates. The rugged design allows users to load with heavy equipment and withstand the harsh work environment. Critical seams that receive stress from weight are reinforced with double and triple stitching to prevent separation. Safely and efficiently pull heavy loads up to 6,000 pounds at faster speeds, reducing downtime. Whether pulling rope or cable, the G6 Turbo™ achieves the fastest pull time. No loose pieces, allows quick changeover for easy transport. Patent-pending adjustable clamp secures conduit in seconds without any adapters. Setup in less than 60 seconds. Hands down faster. Period.